Amid pro-independence rumblings in the Spanish Autonomous Community of Catalonia, Prince Felipe of Asturias over the weekend presided over a dinner with business and regional leaders at Albéniz Palace in Barcelona, the King’s official residence in the city. 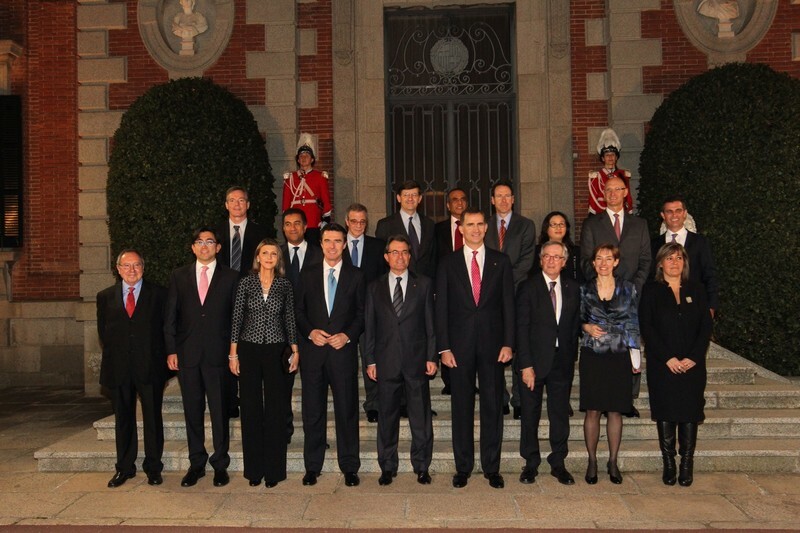 At Albéniz Palace, royal residence owned by the Catalan government. Prince Felipe, who was in town for the eve of the 2014 Mobile World Congress, alluded to Catalonia’s importance within Spain. He spoke of Barcelona as the “beloved and dynamic capital of Catalonia,” and made remarks in Spanish, English and Catalan. 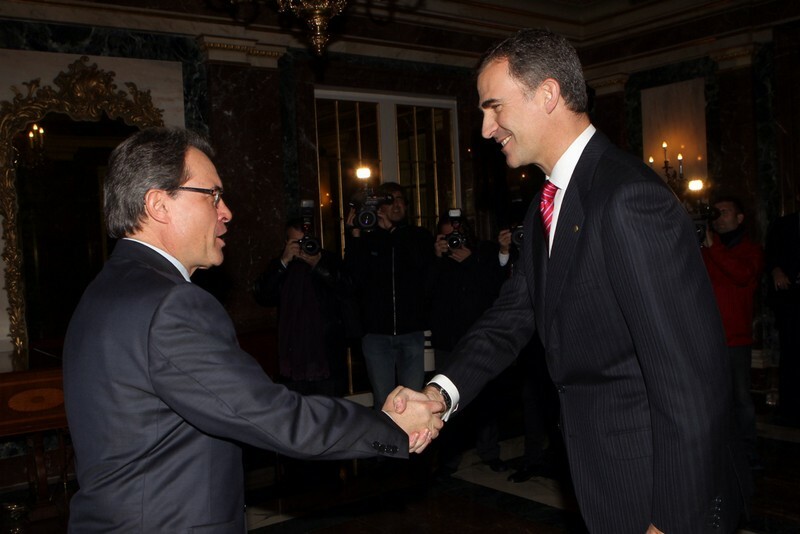 His Royal Highness also met with Catalan President Artur Mas, who is calling for a referendum on independence and, during his own remarks, highlighted Catalonia’s own strengths. On Monday Prince Felipe and Princess Letizia walked the convention floor. One of their meetings was with Facebook chief Mark Zuckerberg. Things got tougher later in the week when a Catalan businessman refused to shake the Prince’s hand. Don Felipe pressed the issue with Alex Fenoll, who kept refusing. A video of the incident has gone viral. Media reports also indicate that other business leaders in Catalonia expressed concerns about the lack of dialogue between Barcelona and Madrid during what has become a political stalemate. Among numerous royal agenda items in recent weeks, today Queen Sofia visited the Spanish National Ballet and the National Dance Company. Her Majesty is known for her attachment to classical arts. Earlier this month King Juan Carlos and Queen Sofia were in Portugal meeting with Portuguese and Italian leaders in Lisbon to promote regional economic development. 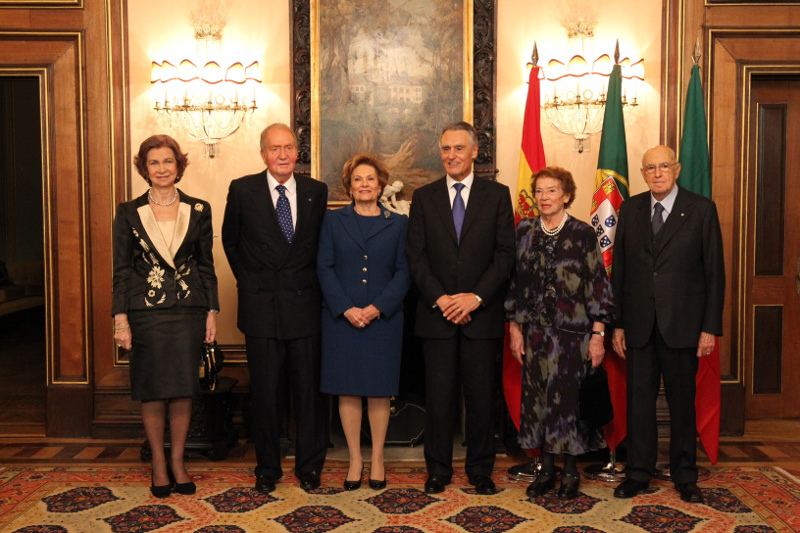 King Juan Carlos and Queen Sofia with Portuguese President Anibal Cavaco Silva, Italian President Giorgio Napolitano, and their wives. Infanta Cristina, King Juan Carlos’ youngest daughter, testified yesterday for several hours before a Balearic Islands judge in connection with her husband’s corruption investigation. Infanta Cristina, according to media reports, said she trusted her husband and also appeared to vouch for his innocence. Anti-corruption investigators believe the the infanta’s husband, Iñaki Urdangarin, used a sports related foundation to funnel public funds for personal use. Even though prosecutors did not want to involve the King’s daughter in the formal investigation, Judge José Castro called her to testify over whether she had any knowledge or played a part in any crimes. King Juan Carlos, Queen Sofia, Prince Felipe and Princess Letizia host a reception for diplomats in Spain at the throne room of the Royal Palace in Madrid. The case has become a major headache for the Royal Family amid Spain’s economic crisis and the public’s widespread disdain for people in power. 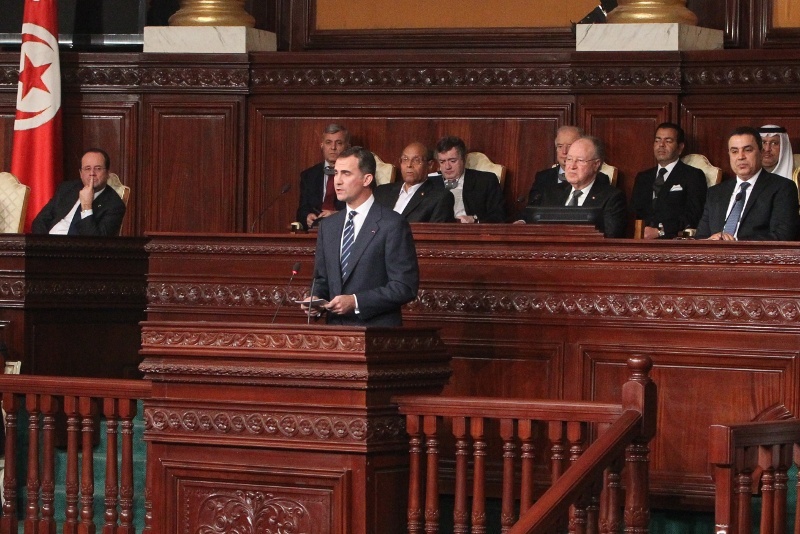 Prince Felipe in Tunisia last week celebrating the country’s new Constitution. About 200 agents were at the courthouse for security, said media reports. There were also numerous supporters and anti-monarchy protesters. She smiled and greeted the crowd. Officials allowed Infanta Cristina’s drivers to drop her off near the courthouse door but they denied any special treatment. King Juan Carlos has assigned salaries for Queen Sofia and Princess Letizia, his daughter in law and future queen consort. 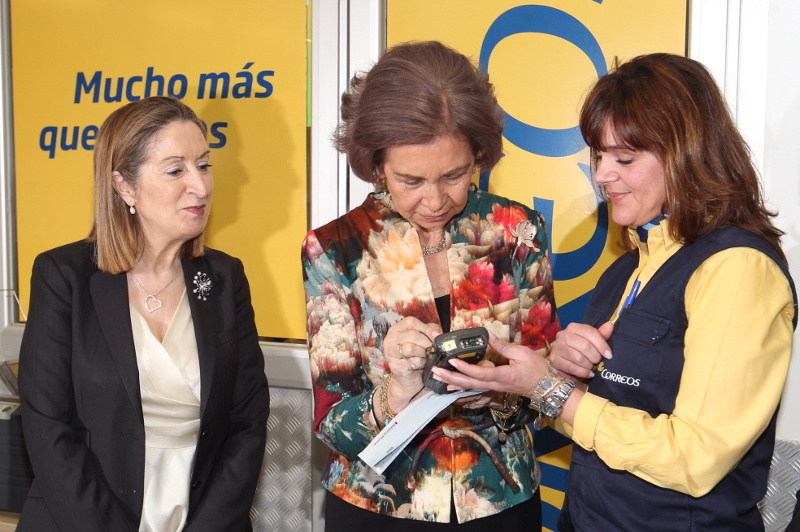 Queen Sofia at a postal facility in Madrid this week. Queen Sofia will receive about 132,000 euros a year in salary and expenses for representing the Crown. Princess Letizia will receive a little more than 100,000 euros. Queen Sofia and Princess Letizia have already been receiving similar amounts, but calling their compensation a salary means they become professional workers in service of the the Head of State, the King. 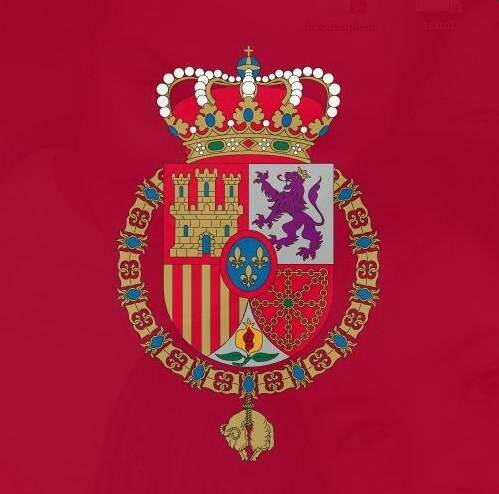 The move has become common among European monarchies and is part of the Spanish Royal Household’s effort at becoming more transparent. Princess Letizia speaking at a cancer event in Madrid this week. The Spanish Royal Household often boasts at being among the cheapest in Europe, costing taxpayers less than 8 million euros a year. Critics, however, say there are other expenses in sustaining the Crown that are not part of the official budget. King Juan Carlos makes almost 300,000 euros for being Head of State. Prince Felipe, his son, makes about 146,000. 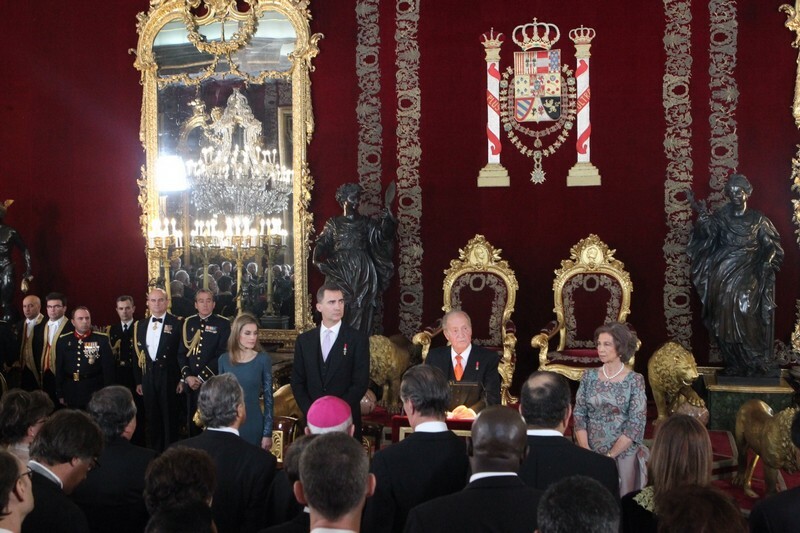 Infanta Elana, who often represents the Royal Family at official events, gets up to 25,000 euro. 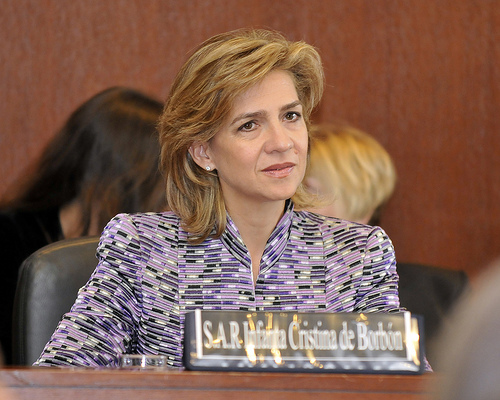 Infanta Cristina, whose husband is being investigated for corruption, has not been representing the Crown at official events and is therefore not on payroll.